This was adapted from a Food Network recipe and tweaked to our taste. Super easy for a long work day. Combine 2 tablespoons brown sugar, the paprika, mustard powder, 2 teaspoons salt and 1/2 teaspoon pepper in a small bowl. Rub the spice mixture all over the pork. Heat the olive oil in a large skillet; add the pork and cook, turning, until browned on all sides, 5 minutes. Remove the pork and transfer to a plate; whisk 3/4 cup water into the drippings in the skillet. 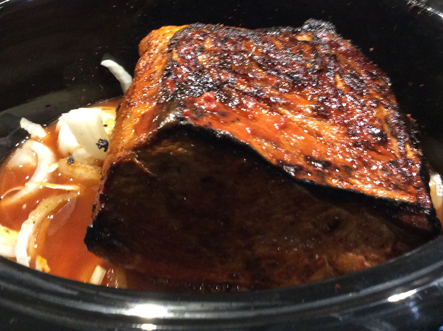 Transfer the liquid to a 5-to-6-quart slow cooker. Put the onions in the bottom of the pan. Add the vinegar, tomato paste, the remaining 2 tablespoons brown sugar and 2 cups water to the slow cooker and whisk to combine. Add the pork, cover and cook on low, 8 hours. Remove the pork and transfer to a cutting board. Strain the liquid into a saucepan, bring to a boil and cook until reduced by half, about 10 minutes. Season with salt. Roughly chop the pork and mix in a bowl with 1 cup of the reduced cooking liquid, and salt and vinegar to taste. Serve on buns with barbecue sauce and coleslaw or with hoecakes (corn pancakes). 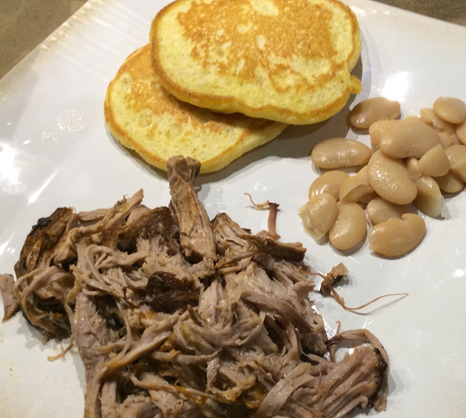 I also made a smokey sweet BBQ sauce to add on top of the pork for a little different flavor.